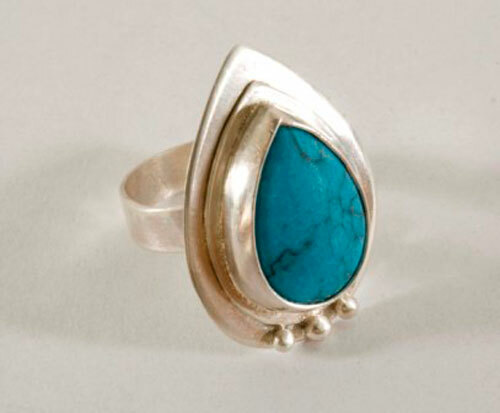 This sterling silver ring is a custom order made on the choice of a turquoise in our online stone catalog. 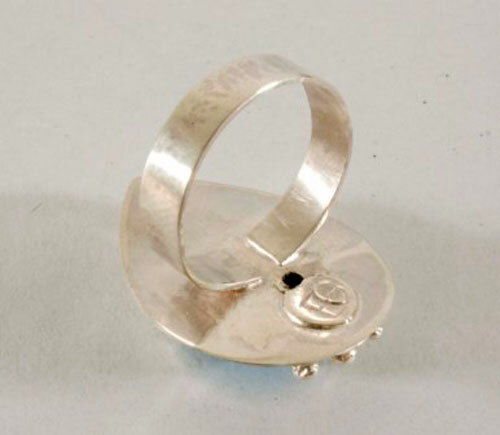 The requirements imposed by the client were the ring keeps the shape of drop of the semi-precious stone and the setting be realized on a sterling silver sheet to give him a seat and volume. These are indications that we followed to achieve Firoza ring and highlight the beautiful blue turquoise. The semi-precious stone drop shape based on two sterling silver sheets almond shaped to give height to the ring. 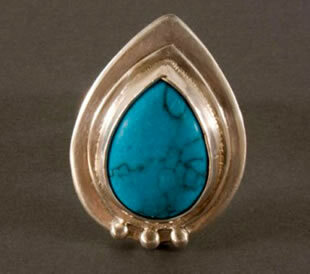 Turquoise is centered on this plateau simple and chic design, accented with just three silver spheres. I named this Firoza, which means turquoise in Hindi. She reminded me of some forms of Indian motifs in drop or almond, which adorns the art of India. The surface is 2 x 3 cm. Tag: ring, sterling silver, 925, unique, romantic, gift, Valentine’s Day, Mother’s Day, birthday, gout, cabochon, semi-precious stone, custom command, turquoise, blue, India, indian, Hindi, almond.